ICC/IF: HEK-293T cells transfected with Renilla Luciferase. ab236020 is a PBS-only buffer format of ab185925. Please refer to ab185925 for recommended dilutions, protocols, and image data. Our Abpromise guarantee covers the use of ab236020 in the following tested applications. Immunofluorescent analysis of 4% paraformaldehyde-fixed, 0.1% Triton X-100 permeabilized HEK-293T (Human epithelial cells from embryonic kidney) cells transfected with Empty vector or Renilla Luciferase, labeling Renilla Luciferase with ab185925 at 1/1000 dilution, followed by Goat anti-rabbit IgG (Alexa Fluor® 488) (ab150077) secondary antibody at 1/500 dilution (green). 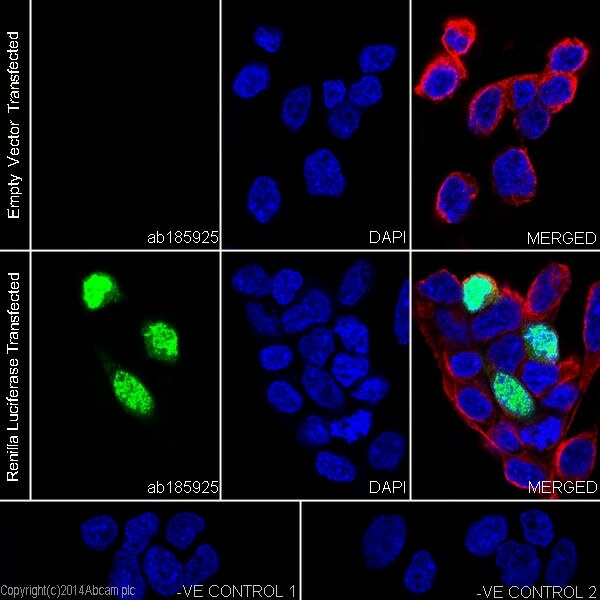 Nuclear staining on HEK-293T cells transfected with Renilla Luciferase is observed. The nuclear counter stain is DAPI (blue). Tubulin is detected with ab7291 (anti-Tubulin mouse mAb) at 1/1000 dilution and ab150120 (AlexaFluor®594 Goat anti-Mouse secondary) at 1/500 dilution (red). -ve control 1: ab185925 at 1/1000 dilution followed by ab150120 (AlexaFluor®594 Goat anti-Mouse secondary) at 1/500 dilution. This data was developed using the same antibody clone in a different buffer formulation containing PBS, BSA, glycerol, and sodium azide (ab185925). ab236020 has not yet been referenced specifically in any publications. Publishing research using ab236020? Please let us know so that we can cite the reference in this datasheet. There are currently no Customer reviews or Questions for ab236020.